Erik and I want to thank you for setting up a superb golf trip for us in August. 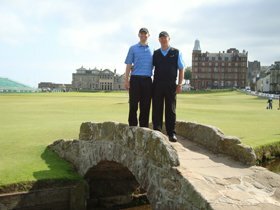 It’s been a month since we were at the Old Course Hotel and golfing at the Old Course at St. Andrews. Of course, all the other golf courses and hotels were fantastic. The weather was great. The roads were easy to navigate because you gave us good directions. We are thinking about golfing in Ireland the Summer of 2012.